Pendants are perhaps the most versatile of all decorative lighting fixtures.They can be as dramatic as a chandelier, as understated as a wall sconce or as functional as a floor lamp. They can be used to provide ambient, task or accent illumination. They can be used alone on in groupings. They are available as line voltage, low voltage halogen and LED. They can be made of glass or metal or a combination. They can be modern, traditional or transitional. 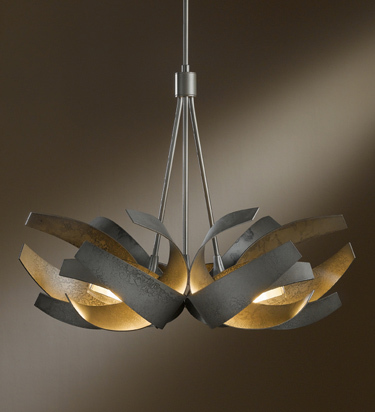 Whatever your taste and lighting need there is a pendant for you. Pendants are traditionally used in kitchens as task or accent lighting over islands, sinks or kitchen tables. 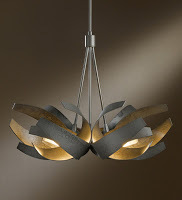 But pendants are also used in foyers, in hallways with high ceilings, in dinning rooms over tables and in bathrooms. They are used as exterior fixtures on porches and entries. As long as you have adequate ceiling height, you can use pendants almost anywhere. When choosing a pendant be sure that the light output meets your lighting needs. I have customers who would love to have small, colorful pendants over task ares in their kitchens. Unfortunately most of these do not provide enough task light for the application. So unless you can supplement the light with recessed lighting, such fixtures do not provide sufficient lighting for kitchen tasks. Be a savvy shopper and always match your lighting needs to the fixture you are buying.